Last night our family returned from a two week vacation which included a week at Lake Tahoe, a family reunion in California, and an overnight at the Grand Canyon. The four of us logged a lot of car miles over the past two weeks. I find the final stretch of any road trip to be the hardest, and last night was no exception. I felt like the miles to Waco slowly ticked by. The beauty of Lake Tahoe is hard to describe. I have been fortunate to have visited and even lived in some beautiful places in my life. The lake itself seems almost like a surprise waiting to be discovered by the fortunate traveler. We drove a fourteen hour day our last day of driving to Tahoe, and until the last forty-five minutes of our trip we were driving through desert. Yes, there were mountains, but they were dry and dusty looking with no trees to speak of. Maybe that was why we loved Lake Tahoe so much because of what the surrounding area looked like! The temperatures were also wonderful. After the hot temperatures of Central Texas, the cool nights and mornings, and mild days were a welcome respite. Surrounding the condo as well as the entire lake, were tall pine trees that smelled fresh and clean. I never tire of that smell! I delighted in waking each morning to a blue sky offset by the green tree-tops of the pines. I also found some spectacular pine cones that came home in the trunk of our car. The pine trees of Lake Tahoe produce the large pine cones, not the wimpy-sized ones! 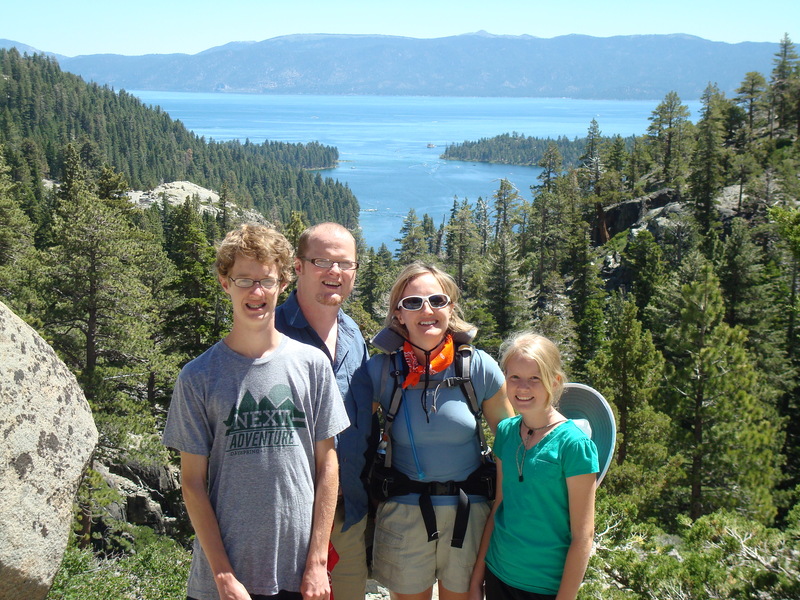 Our family enjoyed kayaking, hiking, swimming, playing games, shopping, and, of course, eating while we were there. We ate some great meals while on vacation. We were glad to enjoy all of this with my parents, who stayed at the condo too. Another highlight of our trip was a family reunion. I hadn’t seen some of my cousins in six years, and it was fun to reconnect with them as well as see how much their children had grown. The weather was perfect on the actual reunion day, and we enjoyed sitting outside while we grazed on yummy food all day (isn’t that what reunions are for? ), and watched the kids play pick-up games of softball and soccer. We all took lots of pictures to capture the day. As we drove away the next day, both Jacob and Anna commented on how much they enjoyed their time with their second cousins. They are ready to plan for the next time we can all be together. Grandma Smith’s ninetieth birthday seems like the perfect opportunity! Finally, the last leg of our trip included a quick stop at the Grand Canyon. We knew going into the trip that we had a short window of time to stop, but everyone we talked with encouraged us to stop even if it was for just four hours. I had been to the canyon as a child, but Brad and our kids had not seen it yet. Since our family enjoys hiking, we decided to spend the bulk of our time hiking a trail that actually took us down into part of the canyon. We hiked the South Kaibab trail and went as far as Cedar Ridge. The park is very clear about the difficulty of the trails, and what a hiker needs in order to be prepared to hike the trails. I think we passed at least four volunteer park rangers on the trail we hiked, and each of them asked how we were doing and if we had enough water. Going down was the easy part. Although, the path was quite sandy and it was easy to slip if one wasn’t careful. However, going up was one long assent to the top. I had a better understanding of how people can get into trouble when hiking in the canyon. The highlight for me was as we reached the top of the trailhead my phone rang indicating I had a voicemail message. Once I got a signal, I discovered it was our realtor telling us we had an offer on our house! Without going into all the details, our house is under contract and we plan to close on August 8th. This is a huge answer to prayer, and it feels like a burden has been lifted from my shoulders. As my final days in Waco draw to a close, I hope I can say goodbye well, and not let the many details overshadow being fully present to what each day has to offer. Being a task-oriented sort of gal, this is hard for me to do. Waco has been home for the past five years, and our Live Oak and Baylor communities have been sources of great joy to our family. Leaving them will be hard. Most likely, the next time I post I will be in Stony Brook in the midst of unpacking and creating a new home there. I won’t even begin to think of how many miles that trip will be! Just enjoying reading your news as I have a late cup of coffee this morning. We are “kid-less at home” this week for perhaps the first time in almost 18 years, as both boys are in China and Kathleen is at Anvil Island for a week of summer camp. Thanks for letting us in on your life – hope the move goes well! -Susan R.